Who Was Oregon’s Most Valuable Player This Season? The 2018 Oregon Ducks had their share of superstars. The team that has become famous for producing some of the fastest, most dynamic athletes in the country once again fielded a number of quality players who became household names this season. But who among them was the best? If you had to choose the one player that impressed you the most this year, who would it be? Herbert had another terrific season. It’d be hard to pick against the Ducks’ star quarterback Justin Herbert. 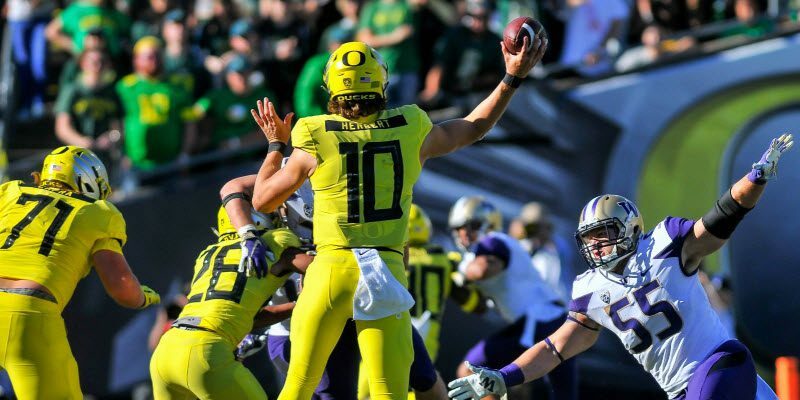 The strong-armed triggerman threw for nearly 3,000 yards and 28 touchdowns to just eight interceptions, leading the Ducks’ offense to yet another prolific season. He was able to put together his first full season of action, and he didn’t disappoint — validating his status as a projected first-round NFL draft pick. He put together several memorable efforts in a year that was full of entertaining matchups. His performances against Stanford and Cal were remarkable, but his role in the Ducks’ upset of Washington was even better. Behind his right arm, the Ducks managed to topple the Pac-12 giant, as he made critical throws time after time against one of the best secondaries in the country. But what Herbert’s favorite target? Receiver Dillon Mitchell built upon a couple of promising games to end 2017 and became one of the most dangerous receivers in the country this season. He was often the Ducks’ only receiving threat, but that didn’t stop him from routinely racing past opposing defensive backs and lighting up the stat sheet. He finished the regular season with 69 receptions for 1,114 yards and nine touchdowns, leading the Ducks by a mile in each category. His performance against Stanford was perhaps the best by any player this season, and he followed up that game with a dominant stretch during conference play that proved his historic effort against the Cardinal was far from an aberration. While Herbert and Mitchell were seemingly playing catch at times this year, little attention was being paid to an offensive line that for much of the season was among the best in the country. Left tackle Penei Sewell lived up to his lofty recruiting ranking. He put together a magnificent debut season before it was cut short due to injury, and he looks to be a future all-conference talent. 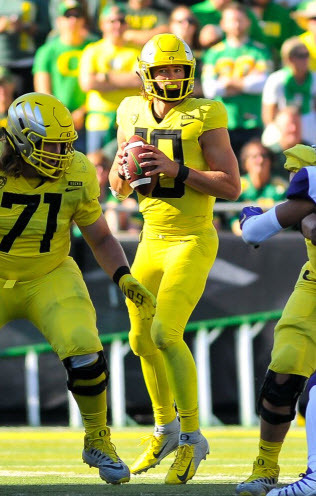 Center Jake Hanson was a steady force that spearheaded the Ducks’ beatdown of rival Oregon State, earning a spot on Pro Football Focus’s “Team of the Week.” And stalwart Calvin Throckmorton spent time at nearly every position on the offensive line, as he anchored a group that managed to overcome adversity during the season. Scott succeeded despite commanding multiple blockers. 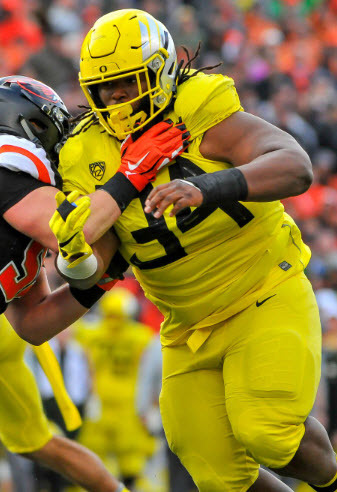 Defensively, nose tackle Jordon Scott may have been the Ducks’ best run defender since Haloti Ngata. His talent was always evident, but what was even more impressive to watch was his persistence and effort, as he continued to be a disruptive force despite facing constant double teams. Linebacker Justin Hollins was a one-man wrecking crew, leading the Ducks in sacks and tackles for loss. He was overlooked entering the season, with opposing offenses focusing on Jalen Jelks and Troy Dye. But by the end of the year, everyone in the conference was very familiar with the rangy pass rusher. Safety Ugochukwu Amadi served as the Ducks’ Swiss Army Knife in his best season to date. He specialized in a variety of areas, jumping routes in pass coverage, rushing the passer and returning punts at an elite level. He embraced his role as the leader of a defense that showed progress towards the end of the year, and he was the Ducks’ best playmaker on that side of the ball. With all of these standouts to choose from, the opening question remains: whose season was the most impressive? Comment below and let us know who you think the Ducks’ most valuable player was in 2018.